In an August 24, 2015 article for the New York Times, Aaron Carroll, a professor of pediatrics at Indiana University School of Medicine, spends a lot of time debunking the myth that people need to drink eight glasses of water a day and discussing a 2015 study in the American Journal of Public Health (1) which, in reporting that more than half of children ages 6 to 19 studied were dehydrated, Carroll says, has stoked unfounded fears that "otherwise healthy ... children are walking around dehydrated, even that dehydration has reached epidemic proportions." 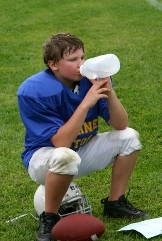 While recognizing that what he termed "real dehydration", such as "when the body has lots a significant amount of water because of illness, excessive exercise or sweating, or an inability to drink, is a serious issue," the problem, Carroll says, is that the study defined dehydration as a urine osmolality (a measure of urine concentration) as 800 mOsm/kg or higher, which, as a clinician, he rarely, if ever, uses to decide if a child is dehydrated, and which no study that he could find through a web search used as a measure of dehydration. Carroll claimed, citing a 1984 study (2), that the "human body is finely tuned to signal you to drink before you are actually dehydrated." 2. Phillips PA, Rolls BJ, Ledingham J, Morton JJ. Body fluid changes, thirst and drinking in man during free access to water. Physiology & Behavior. 1984;33(3):357-363.